Published at 29/08/2017 20:53:09 from Argentina, 6131 visits. 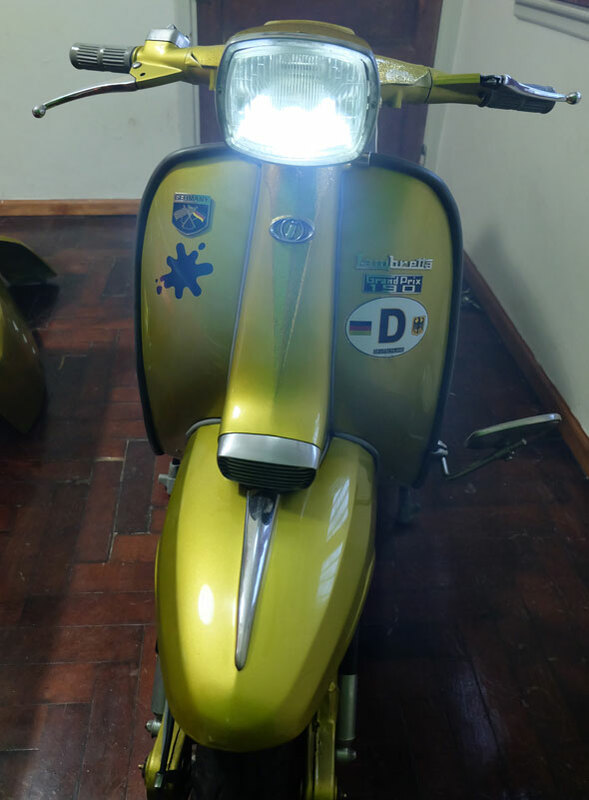 Lambretta GP190. I use very little after her reassembly. All spare parts are with very little use, excellent quality. Engine 2t with heat group mugello 186 (made in italy). Carburetor dellorto phbl26 (made in italy). Ancillotti seat racing (made in uk). Pm sports exhaust tuning (made in uk). Reinforced clutch of 5 discs (made in italy). On electronic 12v with lightened flywheel (made in italy). Digital speedometer sip (made in germany). Tubeless aluminium rims sip (made in germany). Extra large fuel tank 12 litres jet200 (made in usa). New shock absorbers front and rear. Covered mezteler me5. Steel rear carrier (made in vietnam). Side mirror (made in italy). The same is with approximately 1500 km (or less). As extra give porta central assistance of steel wheel stainless steel (made in vietnam). A pair of covered continental contitwist unused. A couple of side plates (to restore). A glove box and an original tank (which was placed before the 12-litre tank). Sports adjustable handle atomic (made in vietnam). Approximate speed of probe: 130 km. You can travel safely to 90/100 km. accept reasonable offers. The price is in dollars or pesos on the day of the sale.